The Gerald Desmond Bridge (named after a Long Beach politician) is another example of a steel truss arch that will soon be gone. It was built in 1968 by the Port of Long Beach, who didn't have the personnel to maintain it and have been trying to relinquish control to Caltrans. Because the existing bridge has only 155 ft (47 m) of vertical clearance over Cerritos Channel, the port is now planning to replace the existing structure with a cable-stayed bridge with 200 ft (61 m) of vertical clearance that will allow taller container ships access to the port. 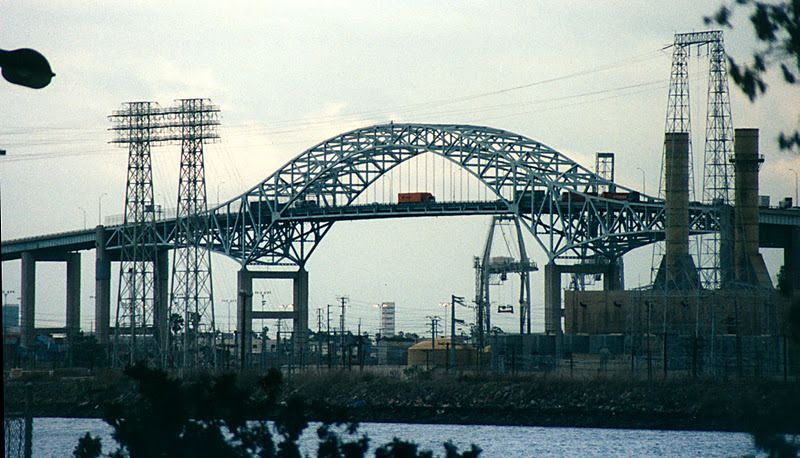 The existing bridge has a 410 ft (125 m) long main span and carries traffic between Terminal Island and Long Beach. Arch Bridges: Gerald Desmond Bridge by Mark Yashinsky is licensed under a Creative Commons Attribution 3.0 United States License.